A visit to the Venice Ghetto with the Judaica Europeana newsletter. Digital content tells the story of 500 years of segregation but also of a unique community at the crossroads of cultures. Click here to read the entire Judaica Europeana newsletter #8. On the AthenaPlus website readers can now find the new AthenaPlus brochure giving an overview of all the creative tools, software, and services developed in the frame of the project. “Innovative tools for the creation, reuse and retrieval of digital cultural content” introduces GLAMs, researchers, cultural heritage specialists, teachers, students, and interested users to the AthenaPlus world of open-source tools (MOVIO, CityQuest), useful publications dedicated to digital cultural heritage topics, and services such as the TMP² (thesaurus management platform) or the Digital Exhibitions Working Group. 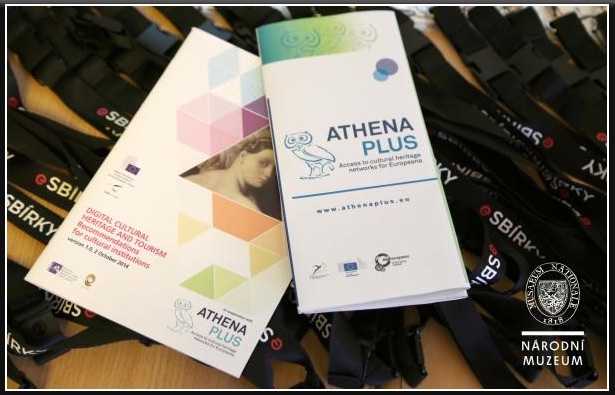 Feel free to download and share the AthenaPlus brochure “Innovative tools for the creation, reuse and retrieval of digital cultural content”. Click here to find the AthenaPlus brochure! The AthenaPlus booklets continue the publication series authored in the frame of the former ATHENA and Linked Heritage projects. These booklets were praised for their value and usefulness for the GLAMs industries. The three booklets produced in the AthenaPlus project continue this success story and present to the readership up-to-date topics from the field of digital cultural heritage and digital cultural content management. They introduce aspects of highly-relevant themes such as digital storytelling, collections management and describing digital exhibitions. GLAM institutions wishing to deepen their knowledge on any of these fields find in the booklets helpful advice in how to proceed. The booklets address a wide audience, especially from the GLAM sector, and offer information derived from the project’s work in a precise and easily understandable format. The publications can be downloaded from the AthenaPlus project website. The booklet on “Digital Storytelling and Cultural Heritage: Stakes and Opportunities” is based on the “Report on existing tools and devices related to narrative approaches and requirements functionalities”that gives an overview of tools and applications that may serve as examples for the development of creative applications for the use and reuse of digital cultural heritage content. Starting from the results of this report the booklet on Digital Storytelling intends to inform GLAMs about opportunities and stakes connected to digital storytelling. 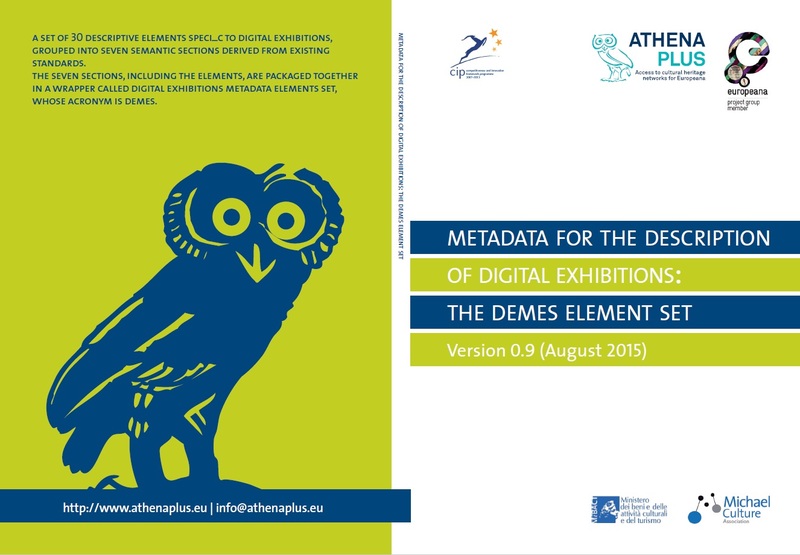 The booklet on “Metadata for the Description of Digital Exhibitions: The DEMES Element Set” was put forward by the Digital Exhibitions Working Group, an international association of researchers dealing with questions and practices connected to the creation of digital exhibitions. The best-practices booklet on DEMES summarizes the research work carried out by the working group and introduces an easy schema for the description of digital exhibitions helping GLAMs to improve the current descriptive practice through standardization and thus facilitate the accessibility and discoverability of digital exhibition in the web. The booklet on “Implementing LIDO” provides to potential and new users of LIDO (Lightweight Information Describing Objects) a methodology for implementing the XML schema. The presented LIDO implementation methodology was developed in the AthenaPlus project as part of WP 2. It focuses on providing help and advice to users so that data can be exported successfully to portals and platforms. 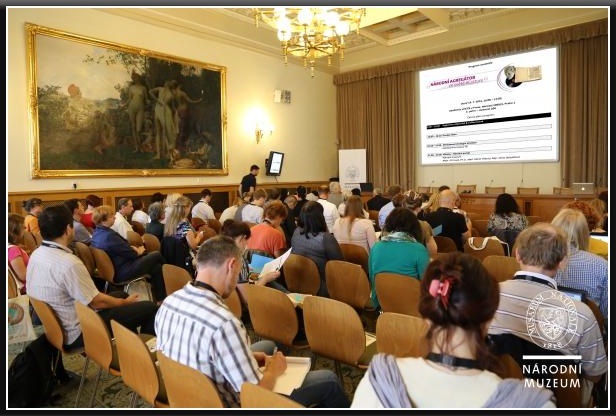 The AthenaPlus conference “National aggregator in the world of eCulture” was held on the 14th of July 2015 at the Czech Academy of Sciences in Prague. Main theme of the conference was coordination of digitization of the cultural heritage in the Czech Republic and the role of national/sectoral aggregators in the process of digitization. The conference was open to the representatives of sectoral aggregators from the Czech Republic who were given the opportunity to share their knowledge and experience in digitization and aggregation of cultural content via Europeana. The participation of the Ministry of Culture of the Czech Republic at the AthenaPlus conference was also of great significance, as the ministry presented their strategy of digitization. The National museum presented the AthenaPlus project and the “eSbírky” portal (http://www.esbirky.cz/), explaining the importance of content providers and their role in publishing cultural heritage content on the Europeana portal. Colleagues of the National museum have presented to the public the main outcomes of the AthenaPlus project and summarized possibilities of future cooperation with the project. The AthenaPlus conference in Prague was a huge success because experts from the Czech Republic and Slovakia in the field of digitization and aggregation of cultural content were invited to take part in the event. Participants of the conference and the Ministry of Culture of the Czech Republic discussed strategies of digitization. The National museum shared their experiences gathered in the course of the AthenaPlus project with the audience, presented outcomes of the project and explained the role of content providers and aggregators for the Europeana portal. AthenaPlus promotional material – such as tote bags and note pads – were very much sought-after on the day of the conference. Click here to have a look at the photo gallery of the event. More information about the conference “National aggregator in the world of eCulture” can be found by clicking on the link (in Czech only). 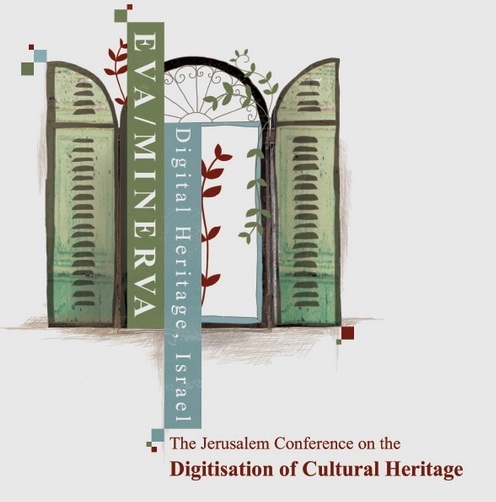 Save the date – next November 8th and 9th at the Van Leer Institute Jerusalem will take place the 2015 EVA/Minerva Jerusalem International Conference on Advanced Technologies for Culture. Track of the World Union for Jewish Studies focusing on Digital Humanities. The presentations of the last conference are available at http://2014.minervaisrael.org.il and the conference site is at http://www.digital-heritage.org.il .